For other people named Mary Tudor, see Mary Tudor. Mary Tudor (/ˈtjuːdər/; March 1496 – 25 June 1533) was an English princess who was briefly Queen of France and later progenitor of a family that claimed the English throne. The younger surviving daughter of Henry VII, King of England and Elizabeth of York, Mary became the third wife of Louis XII of France, more than 30 years her senior. Following his death, she married Charles Brandon, 1st Duke of Suffolk. The marriage, which was performed secretly in France, took place during the reign of her brother Henry VIII and without his consent. This necessitated the intervention of Thomas Wolsey, and although Henry eventually pardoned the couple, they were forced to pay a large fine. Mary's second marriage produced four children, and through her eldest daughter Frances, Mary was the maternal grandmother of Lady Jane Grey, who was the de facto monarch of England for nine days in July 1553. 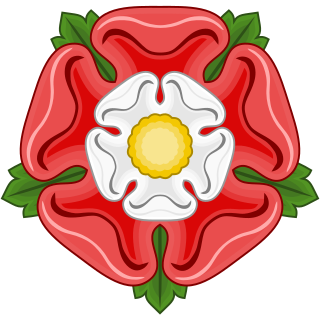 Mary was the fourth child of Henry VII of England and Elizabeth of York, and the youngest to survive infancy. She was born at Sheen Palace, probably in March 1496. A privy seal bill dated from midsummer 1496 authorizes a payment of 50 shillings to her nurse, Anne Skeron. Also, Erasmus stated that she was four years old when he visited the royal nursery in 1499–1500. At age six, she was given her own household, complete with "a staff of gentlewomen assigned to wait upon her", a schoolmaster, and a physician. She was given instruction in French, Latin, music, dancing, and embroidery. As children, Mary and her brother, the future King Henry VIII, shared a close friendship. He named his first surviving child, the future Queen Mary I, in her honour. They lost their mother when Mary was just six, and given the number of bills paid to her apothecary from 1504 to 1509, it would appear that Mary's own health was fragile. Known in her youth as one of the most beautiful princesses in Europe, Erasmus said of her that "Nature never formed anything more beautiful." In 1506, during a visit from Philip I of Castile, Mary was called to entertain the guests, dancing, and playing the lute and clavichord. In September 1506, Philip died, and on 21 December 1507, Mary was betrothed to his son Charles, later Holy Roman Emperor. The betrothal was called off in 1513. Instead, Cardinal Wolsey negotiated a peace treaty with France, and on 9 October 1514, at the age of 18, Mary married the 52-year-old King Louis XII of France at Abbeville. She was accompanied to France by four English maids of honour, one of whom was Anne Boleyn, under the supervision of her old governess lady Joan "Mother" Guildford, who acted as her principal lady-in-waiting. Despite two previous marriages, Louis had no living sons, and sought to produce one, but he died on 1 January 1515, less than three months after marrying Mary, reputedly worn out by his exertions in the bedchamber, but more likely from the effects of gout. Their union produced no children. Following Louis's death, the new king Francis I made attempts to arrange a second marriage for the beautiful widow. Mary had been unhappy in her marriage of state to King Louis XII, as she was almost certainly already in love with Charles Brandon, 1st Duke of Suffolk. King Henry VIII was aware of Mary's feelings; letters from her in 1515 indicated that she had agreed to wed Louis only on condition that "if she survived him, she should marry whom she liked." But Henry VIII wanted any future marriage to be to his advantage. The King's Council, not wishing to see Charles Brandon gain further power at court, was also opposed to the match. Meanwhile, rumors swirled in France that she would wed either Antoine, Duke of Lorraine or Charles III, Duke of Savoy. At one point, even King Francis I, perhaps in hope of his wife Queen Claude's death, was one of Mary's suitors in the first week of her widowhood; Mary asserted that she had given him her confidence in order to avoid his overtures. A pair of French friars went so far as to warn Mary that she must not wed Charles Brandon because he "had traffickings with the devil." When King Henry VIII sent Charles to bring Mary back to England in late January 1515, he made the Duke promise that he would not propose to her. Once in France, Mary persuaded Charles to abandon that pledge; Charles later wrote to the King stating he "never saw a woman so weep." The couple wed in secret at the Hotel de Clugny on 3 March 1515 in the presence of just 10 people, among them King Francis I. Technically, this was treason as Charles Brandon had married a royal princess without King Henry's consent. Thus Henry was outraged, and the privy council urged that Charles be imprisoned or executed. Because of the intervention of Thomas Wolsey, and Henry's affection for both his sister and Charles, the couple were given only a heavy fine of £24,000 to be paid to the King in yearly installments of £1000, as well as the whole of Mary's dowry from King Louis XII of £200,000, together with the gold plate and jewels King Louis had given or promised her. The £24,000, approximately equivalent to £7,200,000 today, was later reduced by the King. They officially later married on 13 May 1515 at Greenwich Palace in the presence of King Henry VIII and his courtiers. In 1528, Charles secured a papal bull from Pope Clement VII legitimizing the marriage. Mary was Charles Brandon's third wife, and he had two daughters, Anne and Mary, by his second marriage to Anne Browne, who had died in 1511. Mary raised the girls with her own children. Even after her second marriage, Mary was normally referred to at the English court as "the French Queen", and was not known as the Duchess of Suffolk in her lifetime, despite being legally allowed to be. Mary spent most of her time at the Duke's country seat of Westhorpe Hall in Suffolk. In the late 1520s, relations between King Henry VIII and his sister Mary were strained when she opposed the King's attempt to obtain an annulment of his marriage to Catherine of Aragon, whom Mary had known for many years. 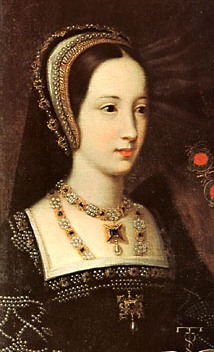 Mary developed a strong dislike for Anne Boleyn (King Henry's intended wife), whom she had first encountered in France. Anne and her sister Mary Boleyn had been among the maids of honor in the entourage that had accompanied Mary to France for her wedding to King Louis XII. In March 1532, Venetian Ambassador Carlo Capello wrote of an incident where "one of the chief gentlemen in the service of the said Duke of Norfolk, with 20 followers, assaulted and killed in the sanctuary of Westminster Sir William Pennington chief gentleman and kinsman of the Duke of Suffolk. In consequence of this, the whole Court was in an uproar." Though it was said to be caused by a private quarrel, he was "assured it was owing to opprobrious language uttered against Madam Anne by his Majesty's sister, the Duchess of Suffolk, Queen Dowager of France." Mary suffered multiple bouts of illness, requiring treatments over her lifetime. She died, age 37, at Westhorpe Hall, Suffolk, on 25 June 1533, having never fully recovered from the sweating sickness she caught in 1528. The cause of death has been speculated to have been angina, tuberculosis, appendicitis, or cancer. As an English princess, daughter of a king, sister to the current king, and a dowager queen of France, Mary Tudor's funeral and interment was conducted with much heraldic ceremony. A requiem mass was held at Westminster Abbey. Her body was embalmed and held in state at Westhorpe Hall for three weeks. On 20 July 1533, a delegation from France joined the English delegation for the lavish funeral ceremony. Her daughter Frances was chief mourner, accompanied by her husband and siblings. Mary's husband and her brother the king did not attend. The funeral procession included 100 torch bearers, clergy carrying the cross, six horses pulling the hearse, other nobility and 100 of the duke's yeomen. The next day, followed a requiem mass and burial at Bury St. Edmunds Abbey. 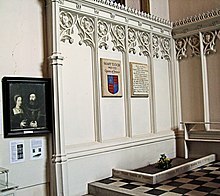 After the death of Mary Tudor, her step-daughters, Anne and Mary, pushed themselves to the head of the funeral cortege just before the coffin was lowered into the crypt of the Abbey of St Edmundsbury, much to the consternation of their half-siblings. Five years later, when the monastery was dissolved, Mary's body was removed to nearby St. Mary's Church, Bury St. Edmunds. In 1784, her remains were disinterred, her coffin opened, and locks of her hair were taken by Horace Walpole, the duchess of Portland, and several others. Upon her arrival in France, Mary was described as being "handsome and well favoured, were not her eyes and eyebrows too light; she is slight, rather than defective from corpulence, and conducts herself with so much grace, and has such good manners, that for her age of 18 years—and she does not look more—she is a paradise." Contemporaries lauded her beauty, with her husband Louis XII describing her as a "nymph from heaven". She regularly took part in masques at her brother's court, and enjoyed "hearing singing, instrumental music, and dancing". Mary was described as "very lively", with one nobleman noting "[she] is never still." She was also said to be cheerful and affable; this is shown when, upon meeting her future husband Louis for the first time, she blew him a kiss in greeting. 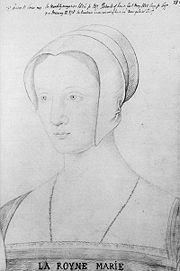 Lady Frances Brandon (16 July 1517 – 20 November 1559), who married Henry Grey, 3rd Marquess of Dorset, and was the mother of Lady Jane Grey. 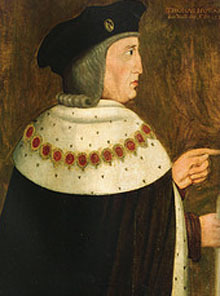 Henry Brandon, 1st Earl of Lincoln (c. 1523 – March 1534). Mary and Charles raised their children at their home at Westhorpe Hall. Their two sons, both named Henry, are commonly mistaken for being the same son. Both boys died when they were children. Mary's widower later married their son's (Henry Brandon, Earl of Lincoln) betrothed, who was also his ward, the 14-year-old Catherine Willoughby, by whom he had his two youngest sons. ^ Sadlack, Erin A. The French Queen's Letters: Mary Tudor Brandon and the Politics of Marriage in Sixteenth-Century Europe Palgrave Macmillan, 2011, p. 44. ^ Weir, Alison. Henry VIII: King and Court. Pimlico. 2002, ISBN 0-7126-6451-3, p. 173. ^ "Preface, Section 1 | British History Online". www.british-history.ac.uk. Retrieved 2018-11-08. ^ Weir, "Henry VIII," p. 185. ^ Weir, "Henry VIII," p. 310. ^ Weir, "Henry VIII," p. 175. ^ "Venice: April 1532 | British History Online". www.british-history.ac.uk. Retrieved 2018-04-26. ^ a b c "Venice: November 1514 | British History Online". www.british-history.ac.uk. Retrieved 2018-11-08. ^ "Venice: October 1514 | British History Online". www.british-history.ac.uk. Retrieved 2018-11-08. ^ "Henry VIII: June 1514, 16-30 | British History Online". www.british-history.ac.uk. Retrieved 2018-11-08. ^ "Venice: April 1515 | British History Online". www.british-history.ac.uk. Retrieved 2018-11-08. Plowden, Alison (1986). Lady Jane Grey and the House of Suffolk. Franklin Watts. ISBN 0-531-15000-3. Perry, Maria (2000). The Sisters of Henry VIII: The Tumultuous Lives of Margaret of Scotland and Mary of France. Da Capo Press. ISBN 0-306-80989-3. Richardson, W.C. (1970). Mary Tudor: The White Queen. Peter Owen Publishers. ISBN 0-7206-5206-5. 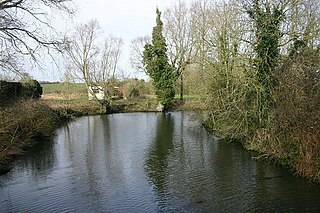 Weir, Alison (2002). Henry VIII: King and Court. Pimlico. ISBN 0-7126-6451-3. Calendar of State Papers, Venice. Chapman, Hester W. (1969), The Thistle and the Rose: The Sisters of Henry VIII, New York: Coward, McGann & Geoghegan, LCC 79-159754. Charles Brandon, 1st Duke of Suffolk, 1st Viscount Lisle, was the son of Sir William Brandon and Elizabeth Bruyn. Through his third wife, Mary Tudor, he was brother-in-law to Henry VIII, King of England. His father was the standard-bearer of Henry Tudor, Earl of Richmond who seized the throne as Henry VII. Suffolk died of unknown causes at Guildford. The Sword and the Rose is a 1953 American-British family and adventure film, produced by Perce Pearce and Walt Disney and directed by Ken Annakin. The film features the story of Mary Tudor, a younger sister of Henry VIII of England. Lady Eleanor Brandon was the third child and second daughter of Charles Brandon, 1st Duke of Suffolk and Princess Mary Tudor, the Dowager Queen consort of France. She was a younger sister of Lady Frances Brandon and an elder sister of Henry Brandon, 1st Earl of Lincoln. She was also a younger paternal half-sister of Lady Anne Brandon and Lady Mary Brandon from her father's second marriage. 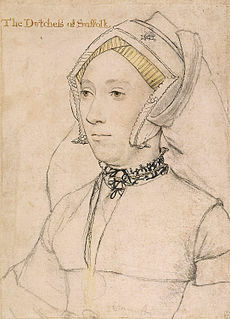 After her mother's death in 1533, her father remarried to Catherine Willoughby and Eleanor became an elder half-sister of Henry Brandon, 2nd Duke of Suffolk and Charles Brandon, 3rd Duke of Suffolk. Katherine Brandon, Duchess of Suffolk, suo jure 12th Baroness Willoughby de Eresby, was an English noblewoman living at the courts of King Henry VIII, King Edward VI and Queen Elizabeth I. She was the fourth wife of Charles Brandon, 1st Duke of Suffolk, who acted as her legal guardian during his third marriage to Henry VIII's sister Mary. Her second husband was Richard Bertie, a member of her household. Following Charles Brandon's death in 1545, it was rumoured that King Henry had considered marrying Catherine as his seventh wife, while he was still married to his sixth wife, Catherine Parr, who was Katherine's close friend. Westhorpe Hall was a manor house in Westhorpe, Suffolk, England. Mary Boleyn, also known as Lady Mary, was the sister of English queen Anne Boleyn, whose family enjoyed considerable influence during the reign of King Henry VIII. Lady Mary Brandon, Baroness Monteagle, was an English noblewoman, and the daughter of Charles Brandon, 1st Duke of Suffolk, by his second wife, Anne Browne. Mary was the wife of Thomas Stanley, 2nd Baron Monteagle, by whom she had six children.